Written by 4/5/2010Share this story on Facebook! 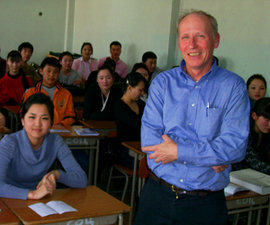 Politics professor Tom Shevory in a classroom in Mongolia. The theme for this year’s Finger Lakes Environmental Film Festival is “open spaces.” Ithaca politics professor Thomas Shevory knows a thing or two about that. As a Fulbright scholar, he has spent the past academic year in the world’s most sparsely populated country, teaching American studies, American politics, and international environmental film at the National University of Mongolia. Though on leave from IC, Shevory continues to teach Ithaca students through his blog, by exploring customs, social issues, politics, history, and the environment of a place so remote to Americans.